SPRING IS HERE!!! Home located in the best neighborhood of North Park. No mello roos and low HOA. 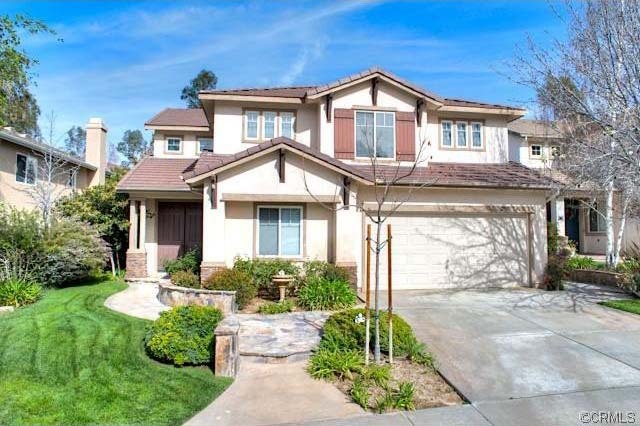 This 4 bedroom and 2.5 bath, with a private office and a den/library…. is waiting for a new owner. Walk up to a flagstone walk way that leads to the front door. Front door entry way has ceramic tiles that opens to a high vaulted ceiling that make the home light and bright. Living room and formal dining room has a light beige wall to wall carpet. Kitchen has granite counter tops and maple cabinets. It also has a granite center island that opens up to the family room with fireplace. Kitchen has hardwood floors, crown moldings and recessed lighting. All bedrooms are upstairs. Master suite opens up to a double door into a spacious bedroom and master bath that has a oval bath tub, see through glass shower and walk in closet. All other bedrooms shares quarter bath. Other features are plantation shutters, custom made curtains, a nice patio and a beautiful landscape backyard. This property is move in condition and a MUST see!